According to the New York City directories, 1828 was the year that John Jacob Astor, the richest American of his day, became a resident of Hoboken. 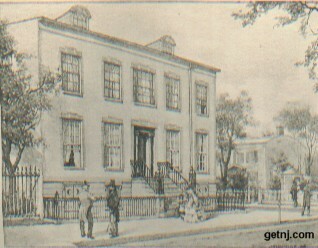 Previous to that time, during the erection of the Astor Villa, still standing in a rather dilapidated condition at the corner of Washington and Second Streets, he occasionally stopped at the famous boardinghouse of the Misses Van Buskirk, on the water-front, which is said to have obtained a finer patronage than any of the other hostelries of this old-time resort. The “old maids Van Buskirk,” as the irreverent called them, in their black silk gowns and white mull caps, doing the honors of their parlors, were well-remembered figures by many of the last generation of Hoboken frequenters, now passed away. They were ideal boarding-house mistresses of the old school, when boarding-house keeping was the one remunerative recourse for reduced gentlewomen; and the pride they took in the fare they gave their patrons, the trimness of their garden, and the skill they exhibited in preserving fruits and making pastries, gave them high recommendation in the eyes of all lovers of comfort and good living. The situation of the Astor Villa was very fine. It was partly surrounded by a large garden, filled by the millionaire with curious foliage, shrubs, and flowers, brought to him from abroad as presents by the captains of his fleet of merchantmen. From its front windows an unobstructed view of the “76 House” and “the green” could be obtained, and there the old gentleman would sometimes resort of an afternoon to enjoy the festive scene and the constantly changing parade along the river-walk. He is remembered as mingling freely with the forgotten throng of pleasure-seekers. Often he would pause in his rambles to acknowledge the obsequious greeting of one of his army of humble servitors; sometimes he stopped to converse with one of his friends, and again he would journey the whole length of the river-walk lost in thought and scowling at every passer-by. One of his favorite resting-spots was a bench by a group of currant bushes at the side of the “76 House.” There, fanned by the sea breezes, he frequently sipped his favorite beverages and shut his eyes to enjoy the pleasant pastime of day-dreaming. The soft shadows would play on his wrinkled face, subduing and tranquillizing the hard features, and the world would pass by and whisper, “There sits the great Astor dozing. Madame Jumel, a noted figure in early New York, when a very old woman, used to tell with great glee a story of how she refused to return one of Astor’s bows when she met him one summer’s day on the Hoboken green. “You would not imagine, my dear,” she used to say to the one who is responsible for the anecdote, “that I snubbed the great Astor, but I did; and there was many a home in New York in those days to which all his money would not have admitted him.” But most likely Astor cared very little for the snubs of a few aristocratic Gothamites of that day, for his own world of commerce and finance bowed and cringed to him, and the care and multiplication of his fortune was his one grand passion. Comparatively little is known of Astor’s life in Hoboken, although few private citizens have had more written about them, both true and untrue, than he has had. There is a tradition that his motive in coming there was to obtain a legal residence in New Jersey. This perhaps is true, but he must have found it very agreeable, for he occupied his handsome brick-and-wood villa for the best part of the succeeding three years, until his departure upon a European trip. It must often have occurred to the Croesus of his day, as he sat playing checkers under the shade of the large chestnut-tree in his garden, that he had been wonderfully successful in the checker game of life, from the time he opened a toy-store in a shanty on Pearl Street, throughout his career, until he became the possessor of millions. Fitz-Greene Halleck, the brilliant poet and wit, of whom Astor was fond enough to leave him a remembrance in his will, spent much of his time at the villa at this period, although he did not enter his employment as a clerk until some years later. One standing by the Hoboken waterfront today and gazing at the great metropolis cannot help feeling something of the charm of this early picture, which is indeed a painting in words! Washington Irving and Martin Van Buren when in New York City often crossed the Stevens Ferry to visit him. Hoboken was a town which pleased them both, for they were very fond of the old Dutch settlements on the Jersey shore, and it was from the Van Home family, who lived in the “House of the Four Chimneys,” still standing in Communipaw, that Irving obtained much of his matter on early Dutch customs for “A Knickerbocker’s History of New York.” Some writers have even gone so far as to state that the book itself was written in the homestead, but a careful perusal of Irving’s letters shows this to be a fiction. The millionaire and his author friend, Washington Irving, used to be constantly seen driving or walking together in the vicinity of Hoboken. They were very popular in a score of nearby old Dutch households, and it is a noteworthy fact that they distributed many bright silver dollar pieces to proud mothers displaying infants bearing their appellations. Hoboken in John Jacob Astor’s time was a great resort for the theatrical world, and to its sylvan solitudes many jaded Thespians came to recuperate before the evening performance. In the shady “Turtle Grove,” made memorable by the feasts of the “Turtle Club,” Lover’s walk, and the wood of fir-trees by Sibyl’s cave, the chance frequenter was always sure to run across some actor deep in his play-book, and speaking unconsciously a telling passage, with only the fleeting birds and whispering leaves to voice approval. A lovely garden by the sea.